Chart Wealth... CBOE Software Index Programmed For Profits! October 2006, Volume 3 Issue 6 Know It - Profit! With the other major indices failing to follow, can the Dow Jones Industrials continue to make new highs? Or... are we seeing a top in large capital stocks? For a clue, check out this month's Featured Index in Market Metrics. The Dow Jones Industrial Average (^DJI) has made new highs... up +7.59% for the year. Half of this year's all-time gain occurred in the last quarter. The Russell 2000 (^RUT) has increased a modest +5.08%... only trading 63 points from its all-time high. So far this year, the Standard & Poor's 500 (^GSPC) and Wilshire 5000 (^DWC) have added +4.85% and +4.53%, respectively. Will the Nasdaq Composite (^IXIC) be able to dig out of its hole? Down -0.27% for the year, the technical index as been lagging... dragging investors down with it. The CBOE GSTI Software Index (^GSO) posted a third quarter addition of +17.62% while the CBOE GSTI Hardware Index (^GHA) wasn't far behind with a +16.11% gain. The PHLX KBW Capital Markets Index (^KSX) was up, as well... adding +8.70% for the quarter. The AMEX Computer Technology Index (^XCI) and AMEX North American Telecom Index (^XTC) are in the black... up +9.00% and +8.63% for the quarter, respectively. This month's featured chart, Salesforce.com (CRM) has exploded... rocketing skyward for an +83% gain since July! The weekly chart of CRM forecasts nothing but profits as the stock prepares to complete an intermediate Elliott fifth wave impulse. 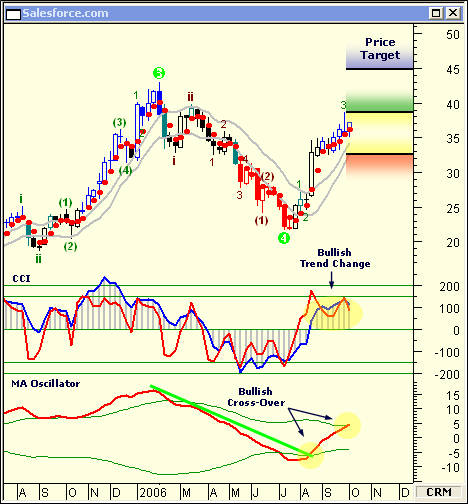 The Commodity Channel Index (CCI) confirms the bullish trend is in place... having been in positive territory for the previous two months. The MA Oscillator has made two bullish crossovers. The trend line break in August and the standard deviation line break this month confirm the upward trend. Look for a minor Elliott fourth wave pull-back to the moving average channel (gray lines) before CRM begins it move to the $45-$49 price target. Historically, October has been a month for profit taking. Additionally, the fourth quarter trading volume often dries up as the year winds down.